There were plenty of great gloves this week, including a few unused gems. Next, and sorry to be repetitive (again), is a Wilson A2000 that sold for just over $640. Needless to say, the A2000 is among the most important lines of glove in our hobby. So it is hard to imagine, but I think this is the first one in this section of the site. I notice the word "adjust" on the back of the web. Was the intent for the user to adjust the lacing of the web? Not sure if that is something I've seen before. A.J. Reach Babe Ruth "Home Run Special" RF3. $565. Rawlings GJ-67 Two-Toned Roberto Clemente model. Absolutely mint. Not bad for an import. $300. Also of note, a Mantle GJ99 in mint condition went for $229...gulp??? 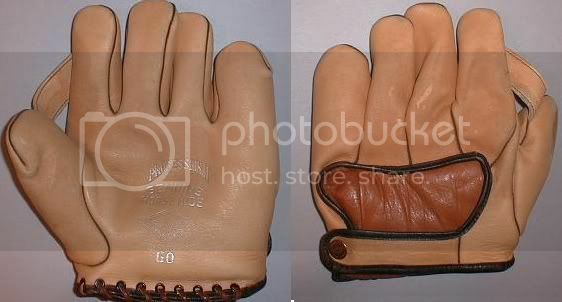 D&M First Baseman Mitt with the Decker Patent. The Decker Patent seems to be more common among catcher's mitts, making this a bit of a rarity. Nice patch, good condition. $264. And lastly is a Spalding Berra personal model catcher's mitt. I was really surprised at the price of this one, $260. Then again, I'm pretty sure I've only ever seen a couple of these come up for bid. Hope you guys don't mind me posting so much but these gloves deserve some comments on how aesthetics and surrounding criteria affect the prices commanded by these mitts. The Clemente, and nearly all the Clemente gloves draw attention, is a knockout to look at with the contrasting brown and tan leather. Even though it's a Rawlings import (find the USA Clemente with the "Bellows" web) I'm not surprised by the price. Almost all the Berra mitts are popular these days. And this is a personal model USA, can't get any better though condition is not great. Berra will sign his mitts too. Decker protective reinforcements are popular on catchers mitts and this is a rarer baseman mitt as Burker says. You could expect this kind of price with a rare Decker. I think the Wilson "adjusta web" could be loosened a bit which is sometimes desired for a more relaxed webbing. A2s and H of Hides do well. Having given the Clemente glove some additional thought, I believe it likely demonstrates the very high end for an import. The glove has everything - unique coloring, great endorser, mint condition. Maybe Mantle's popularity might result in some higher prices, but I'm not sure any of the Mantle imports can compare in aesthetics - at least from what I've seen. As far as my original feeling that the Clemente was overpriced...well, I think in the end that is a matter of taste. 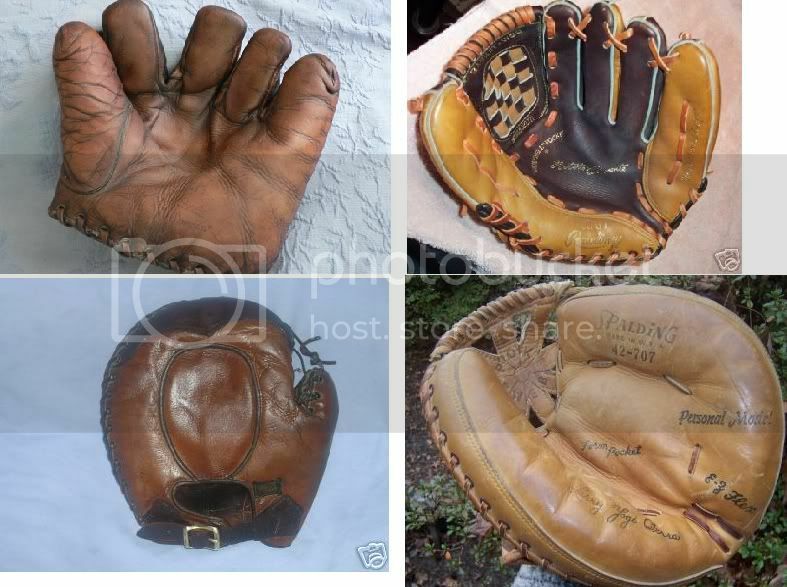 Consider the three gloves pictured (exclude the Ruth it was $500+). All about the same price but very different. The D&M with a unique feature, older, from a popular manufacturer. The Berra, a popular endorser, high quality, average aesthetics. The Clemente, a near mythical endorser, drop-dead mint, but really of average quality at best. Given the choice between the three, I'd take the D&M in a heartbeat and neither the Clemente or even the Berra would have been a consideration. So in the end I think my feeling that the Clemente was overpriced was a matter of personal preference. Opinions on over/undervalued may not mean much. The truth is the value of the glove is what it sold for, especially when you have a marketplace like ebay to determine its market value.